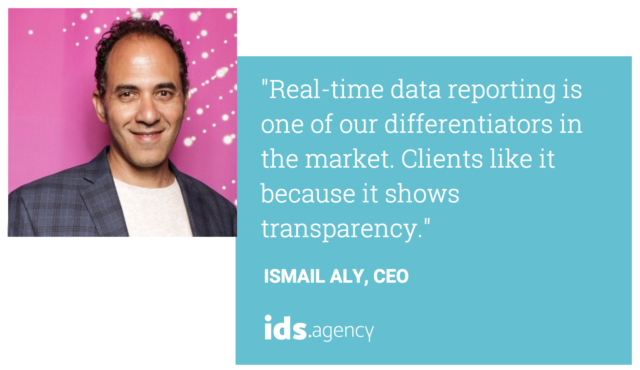 Ismail Aly has leveraged real-time performance data as a key differentiator in the market. Hear how his agency, IDS, leverages the power of Databox to improve client relationships and save hours on reporting every month. What was life like before you were using Databox? Izzy: Life was hard before using Databox. Our monthly reporting with the client was really painful. It used to take us two days to prepare the reports with lots of screenshots and CSV exports. We had to work in Excel to create charts. And the reporting meeting was focused on reading the numbers. We were not really getting anything actionable out of the meeting. After Databox, that changed because we started creating dashboards that automatically update. It’s real-time data so we don’t have to spend time actually crunching these numbers. We can just build a dashboard for that. How do you guys set goals with clients in the first place? We start talking about goals before the prospect becomes a client. It starts in the sales process. It’s all based around their goals. And we try to tie those goals into business metrics, like revenue or number of employees or market share. We start with a metric that’s tied to their core business objective and we start to reverse engineer the funnel from that. In order to achieve this revenue goal, how many customers do you need by the end of the year? And out of those customers, how many of them can you close today without doing anything? So we try to find the gap and then we look at the conversion rate from the qualified opportunity to a customer. So we have a target or a goal for qualified opportunities. We work in reverse all the way to leads and traffic and conversion rates. Are clients used to that type of thinking? It’s a new concept. There are different reactions to it. Some prospects get suspicious because they think it is too many questions. Some of them have actually never thought of it this way. With some new businesses, it’s hard to have those numbers and metrics because there are no previous data to build on. We usually book like a four-hour workshop to go through this goal-setting exercise. What are some common goals they have before they work with you? How do you set the right goals at that early stage? We share basic industry standards of conversion rates or top 10/25 percent performance benchmarks. If the standard conversion rate is around seven percent, then we shouldn’t be actually estimating our strategy around 70 percent conversion. We need to think of other ideas. We set an annual goal and we work with a 12-month retainer. We break it down into quarterly, smaller goals during the strategy session with the client. How do you make sure that you’re on track to hit that goal along the way? We reverse engineer from the revenue goal all the way to number of deals created every month, leads and traffic. And this is where Databox helps us. We actually set Alerts and Goals for every client on a weekly basis. So every week we’re getting the alerts of our progress towards the goal. It’s not just the number of how many leads we generated, but also like 75 percent away or 50 percent away. This is where we start the internal discussion of what we need to optimize, what we need to drill down into and understand what’s not working well. Who are the different parties that are involved in that? We have the account manager, the “inbounders” (the people in HubSpot building the assets), the journalists (or content marketers) and UI designers, if we need to build pages or templates. How do you make sure those all those people are communicating throughout the week? We have several types of meetings. Every team has a daily standup meeting. We have a sprint planning meeting and we have a weekly strategy meeting where we discuss the different dashboards. The account manager uses Databox. He or she gets the alerts on Slack and the daily scorecards. How do you choose which alerts to set up? We want to know how far from the goal we are. So, traffic, MQLs, SQLs, the numbered of leads created etc. How often does the account manager share with the client? We’re sharing an email update that goes out to the client on a weekly basis with the key metrics and distance from the goal for that week. They get the weekly scorecard automatically from Databox. Then, there’s the monthly meeting with the client. Since the client is already getting their data throughout the month, the monthly meeting is more of a strategy meeting. It’s more about discussing the meaning of the data and rather than just reading the numbers on the screen. What happens if there’s a bad result in there? How do you guys address that? We usually we add our recommendations for next steps. For example, if there’s like a Facebook campaign, and some of the assets are not performing well, those are the ad sets that we’re turning off. We’re changing the audiences or refining them. So we put a recommendation about what we’re doing next and compare the results this week and the week after. Are your clients able to keep up with those weekly emails and stay on top of it? It depends. Some of them really enjoy drilling down into data and with some of them, it’s like we know that email is never opened until the monthly meeting. Do clients expect that from you? It’s one of our key differentiators in the market. We’re not emotionally attached to our strategies and what we do. If the data shows what we’re doing is not working, we will trash it and pivot. I think the clients like that because it shows transparency. We’re not trying to hide any information or manipulate the data in any way. Have you seen any impact on retention? Our retention year-after-year is getting better. The clients appreciate our culture of transparency, and Databox is one of the reasons behind that. One of the key differentiators is the whole data-driven strategy. We’re not really selling fluff. We actually use Databox dashboards in the sales process. So we open dashboards and we show the clients how we work. Want to get a firsthand look at how agencies like IDS use Databox to automate their client reports, set client goals, and much more? Sign up for one of our live agency demos.